Audiophiles like their records clean. Real clean. So much so that many of us spend inordinate amounts of money on various and sundry cleaning products -- and services -- to get our records old and new sounding as spiffy and pristine as possible. Some of us who are collectors of previously owned recordings of rare vintage will sometimes go to great lengths to try to salvage a disc. Earlier this year while I was on a little journey around Southern California, I happened up on a fun antiques shop in Palm Springs. Actually, it wasn't really an antiques shop, but more like a bunch of choice -- and not so choice -- old stuff that was just fun and interesting. Ok, some of it wasn't so interesting. There is a nice Yiddish phrase for this kind of store: A "chotch-ka" shop. Ye olde junk shoppe. A "curio" shop. Amidst this mish-mosh, there were about 300-400 old records in that store, 99 percent of which were dusty, crusty toss offs of hit records from eras past. But, crate diggers like myself, we forage onward through the crud in hopes of finding that one gem that will make all the effort worthwhile. There was probably a little eco-system going on inside there at one point but it seemed to have dried out in the intense dry desert heat of Palm Springs. But for, $1, I had to take it. My gut instinct was telling me that this was either going to be a brilliant piece of something-or-other.... or it would be the biggest musical train-wreck known to mankind. 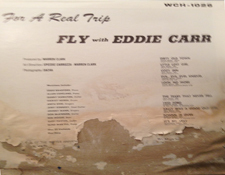 The album, entitled, "For a Real trip, Fly with Eddie Carr" -- you can't make stuff like this up, folks -- depicts a rather curious fellow (I assume it is Mr. Carr, in the flesh) sitting atop a flying carpet (carrying a Beethoven bust and a bowl of fruit) flying over a valley looking into a city that is covered with haze and smog. It is a notoriously low budget, wonderfully amateurish, goofy fun cover with mixed fonts and colors. And then in the midst of the track listing you notice that there is a song called "Evil Evil Evel Knievel." And then on the back cover I could see through the murk a listing of musicians including a couple familiar names from the world of Easy Listening music Anita Kerr and Johnny Mann (both credited with "singers"). Gary Paxton is listed on guitar , a name also familiar but one that I couldn't place at the time -- he may well be the fellow who was a Grammy award and part of the 1960s Bakersfield sound, but I am not sure. That the credits also list someone called "Blind Man Pig" on piano compelled me further still. The final credit for "Also 23 Violinists" and "One Harp" sealed the deal: I was going to buy this dusty musty moldy $1 affair and find out what sort of music was contained inside. Wrapping it in its own plastic bag so it wouldn't mess up my other treasures found along the way on this trip, I brought Mr. Carr's album home and it sat there for a week until I got the courage to open the thing up. 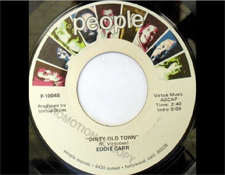 In the interim, I poked around thee Interwebs and -- lo and behold -- was stunned to find that this album is something of a highly sought after album among collectors of so called "Northern Soul" music. 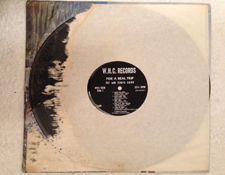 Two tracks on the album had seen single release on other labels but this appeared to be a independently-pressed self released album by the artist (on W.H.C. Records). On some sites, the album was going for upwards of $300! I was thus more encouraged than ever to salvage this confirmed odd little gem.